Today’s social and economic environment is presenting local and global enterprises with complex challenges and opportunities. 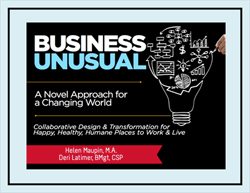 This ebook, Business Unusual, is a collaborative project with Helen Maupin, MA (www.righttojoy.com) to help you create happy, healthy, humane places for people to work and live. Our hope is that it will provide you with ideas and inspiration for designing your organization to thrive in this changing world in which we live!